Hello readers. Hope you are doing ok. Today I wanted to talk about something called GamesDesktop and thought I should give you some removal instructions. If GamesDesktop is installed and running on your machine, you will find some new files running in the Windows Task Manager. I’ll show how to remove GamesDesktop in this blog post with the FreeFixer removal tool. So, how did GamesDesktop install on your machine? It was probably bundled with some download that you installed recently. Bundling means that software is included in other software’s installers. When I first found GamesDesktop, it was bundled with a download called FastPlayerPro. Here’s one example how it appears in the FastPlayerPro installer. Generally, you can avoid bundled software such as GamesDesktop by being careful when installing software and declining the bundled offers in the installer. When I run into some new bundled software I always upload it to VirusTotal to test if the anti-malware software there detect something suspicious. The detection rate is 27/56. Antiy-AVL reports GamesDesktop as Trojan/Win32.TSGeneric, Avast detects it as Win32:Adware-ASG [PUP], AVware reports Tuto4PC (fs), F-Prot calls it W32/S-c61ac5f0!Eldorado, F-Secure calls it Adware.Eorezo.BZ and Symantec calls it WS.Reputation.1. Hope that helped you with the removal. 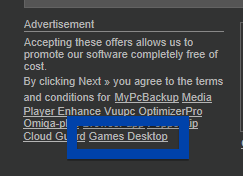 Do you also have GamesDesktop on your computer? Any idea how it was installed? Please share by posting a comment. Thanks! Thanks for reading. Welcome back!